"Native Perspectives on Sustainability: Nichole Maher (Tlingit)"
This program aired on public access television in the greater metro area of Portland, Oregon the week of Oct 29th, 2007. To order a VHS or DVD copy, visit Flying Focus Video Collective. To view a clip of this program, click here. 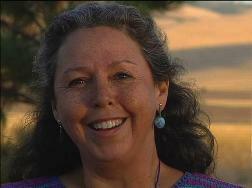 "Native Perspectives on Sustainability: Roberta Conner (Cayuse)"
This program aired on public access television in the greater metro area of Portland, Oregon the week of January 14th, 2008. To order a VHS or DVD copy, visit Flying Focus Video Collective. Help us produce more! To date, 13 interviews have been conducted with indigenous leaders in the bioregion defined by the Pacific Salmon runs of North America. All but one have been video-taped, eight at production level quality. With funding, more of these interviews can be produced into stand-alone pieces for airing on public access and posting on YouTube. To see production costs and to sponsor the production of a video, click here. There is desire to weave the voices of the participants into a feature-length documentary film. If you'd like to help make it happen, please be in touch with David Hall. To make a tax deductible donate to the project as a whole, click here.